[toc]Pregnancy is a difficult time for many women. While giving birth is an enriching experience, the period during which a woman gets pregnant is fraught with challenges. Some of the best herbal remedies for pregnancy include Anise, Ginger, Fennel, Peppermint, Red Raspberry, Cranberry, Oregano and Basil. These herbs are safe to use for pregnant women though doctors should be consulted before opting for any treatment program incorporating them. Herbs can prevent miscarriage, make labor easier and ensure that the pregnant women can ease the suffering caused due to morning sickness. The best part about using herbs is that you can harness nature’s healing powers through the use of these remedies. 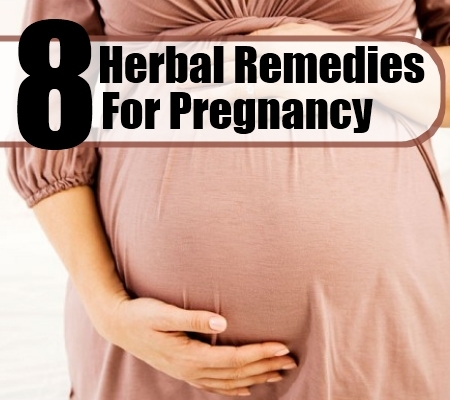 This article will discuss some of the leading herbal remedies for pregnancy. Zingiber Officinale is the botanical name of this herb. Ginger inhibits the production of serotonin which is associated with nausea in pregnant women. This herb is especially effective during the first trimester of pregnancy for easing complications such as vomiting caused due to morning sickness. You can also avoid other problems such as gas and stomach upsets during pregnancy by using this herbal remedy. Drinking Ginger tea can also ease headaches and lower blood pressure in pregnant women. 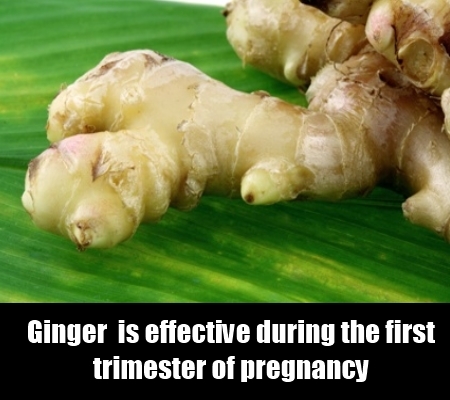 Women should use only about one gram of Ginger 4 times in a day if they are pregnant, according to experts. Ginger tea can be brewed using the fresh, raw roots of this herb. You should drink this tea to ensure relief from morning sickness as well. Peppermint contains menthol which acts as a soothing agent for the gastrointestinal lining of the stomach. 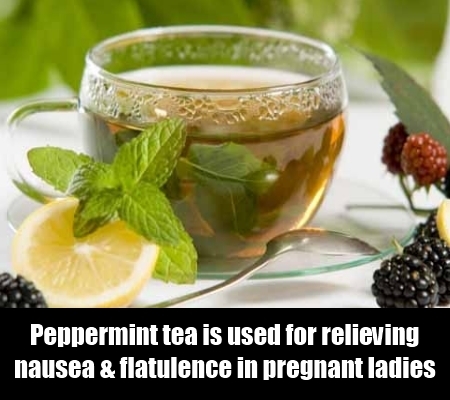 Peppermint tea can be made using the fresh leaves of this herb for relieving nausea, indigestion and flatulence in pregnant ladies. It can also ease morning sickness. Mentha Piperita is the botanical name of this herb. Peppermint is a member of the Mint family and is a perennial herbaceous plant. Peppermint is well known as a cure for poor digestion and stomach upsets. It is often used for curing cold and cough. Peppermint drops can also be taken by pregnant women to ensure good health during pregnancy. 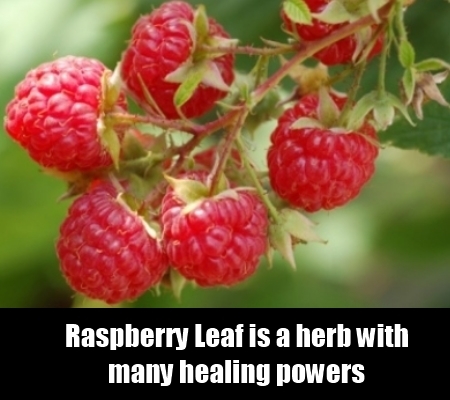 Red Raspberry or Raspberry Leaf is a herb with many healing powers. It strengthens and tones the uterus and ensures good health of the reproductive system in pregnant women. Red Raspberry also contains plenty of nutrients including vitamin B complex, calcium and iron which are good for the mother as well as her child. Herbal tea made from the leaves of this herb relieves nausea, eases leg cramps and enhances the expulsion of the placenta after birth. Some experts belief that this herb can even be used to induce an easy labor. Regulate the consumption of this herbal tea with care as some experts caution that too much of it can lead to uterine contractions. Make sure you use this herb under medical supervision and only after also consulting an herbalist. 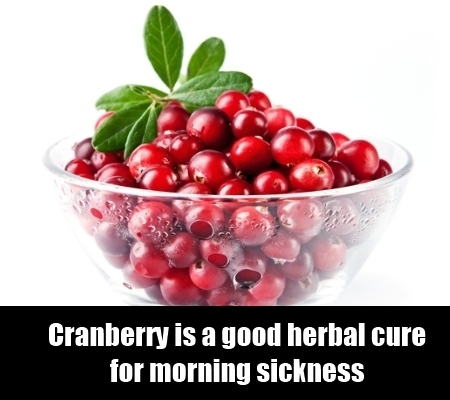 Cranberry is a good herbal cure for morning sickness experienced during pregnancy. The fruits of this herb are essential for enhancing the immunity of the pregnant mother and increasing her ability to fend off diseases and infections during pregnancy. It is very important for expecting mothers to have a safe pregnancy to ensure the good health of the child. Without a strong immune system, a pregnant woman will not be able to protect herself and her infant from potential birth complications due to some infection or disease. Cranberry fruits also ease morning sickness and promote good digestion in expectant mothers. This herb is full of antioxidants which boost immune system functioning and ensure optimal health of both the mother and her soon to be born child during the period of pregnancy. Tea can also be brewed from the fruits of this herb and consumed. Cranberry juice is also a good herbal remedy for pregnancy. Fennel has been used in natural and alternative healing systems for decades. 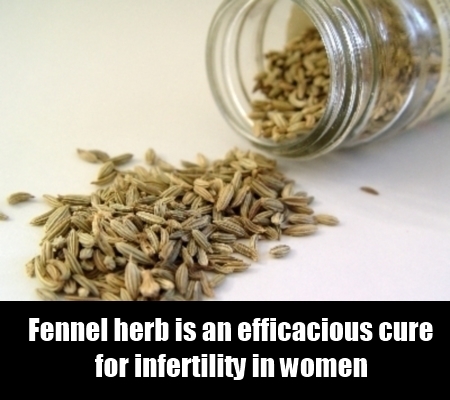 This herb is an efficacious cure for infertility in women. Herbalists also recommend it for pregnant women to ensure a safe pregnancy and good lactation following birth. Adding Fennel to soups and salads in small quantities is a good way to take this herb for gaining its benefits during pregnancy and following birth. Fennel relieves the indigestion and nausea caused due to morning sickness as well. 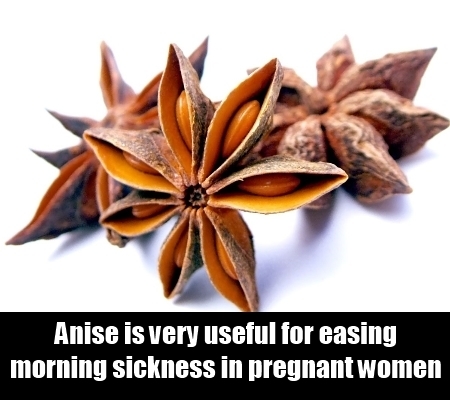 Anise is very useful for easing gastric problems, nausea and vomiting caused due to morning sickness in pregnant women. Anise is also a remedy for poor digestion. It soothes the stomach lining and promotes good digestion of food, ensuring that the body absorbs the nutrients that it needs. Anise seeds can be roasted and soaked in water overnight. You should strain the liquid in the morning and drink it for best results. Anise tea can also be made using the seeds of this herb to ensure relief from nausea and stomach pain. Anise seeds are commonly chewed after food to aid digestion in India, where this herb is known as Sauf. Anise is a safe herbal remedy to use during pregnancy. Basil is a herb which has been used extensively for culinary purposes in Italian dishes. But this herb also has value for pregnant women. It is an ideal herbal remedy for morning sickness and health problems faced during pregnancy. Basil comes in three varieties namely Sweet Basil, Holy Basil and Common Basil. 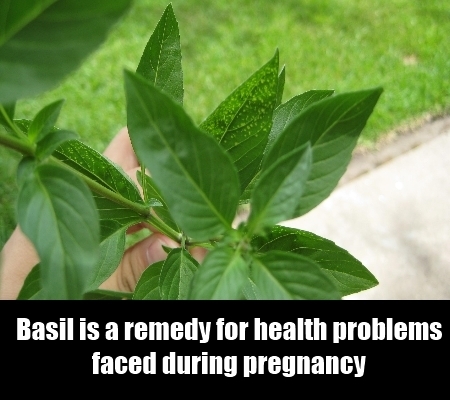 Basil leaves can be chewed for relief from gastric disturbances during pregnancy. Basil can also be easily added to dishes, soups, broths and gravies and consumed in this way to ease the complications during pregnancy. Basil leaves can also be used to make herbal tea which can be sweetened using honey or Stevia leaves. You can drink this tea to ease the problems experienced during pregnancy. Oregano is a common kitchen herb. Its soothing fragrant aroma and pleasing taste dispel dizziness, nausea and headaches during pregnancy. This herb is very safe to use and it can be added to soups, broths and dishes and consumed in this manner for easing gastric problems and relaxing the expectant mother. 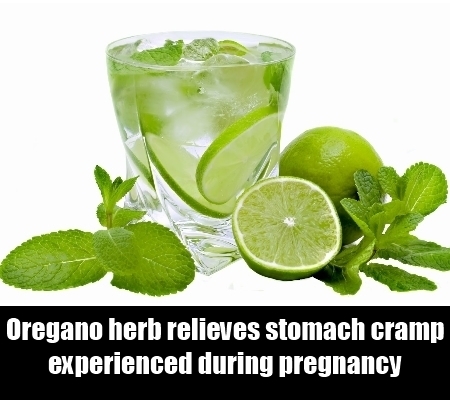 This herb also relieves stomach cramps experienced during pregnancy. The dried leaves of this herb are freely available at health stores and culinary shops for ready use. You can also make soups using this herb for soothing the stomach and settling it down after a heavy meal.